Chance giving out laptops at the #getconnected event at Chicago’s Alcott Prep. Ludacris looks on. 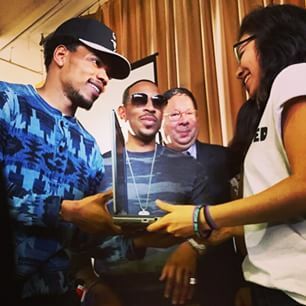 Luda and Chance the Rapper rewarded Chicago’s Alcott high school with brand new laptops for participating in the #getschooled Internet essential project. The goal is to rev students up to use the Web proactively–not just for Instagram and Snapchat–to prepare for college. Alcott ranked second in the project’s success rate of using the Internet to help pave a career path. So, Chi town native Chance made a surprise appearance and brought along a famous friend…LLLOOOUUUDDDAAA. Chance the rapper’s sage words were more to the point, this is what he told the young’uns. If you are an aspiring artist, use the internet to promote your work. Luda helped pass out laptops donated by Comcast Illinois. Followed by meeting all the teens requests to take selfies with him and Chance. 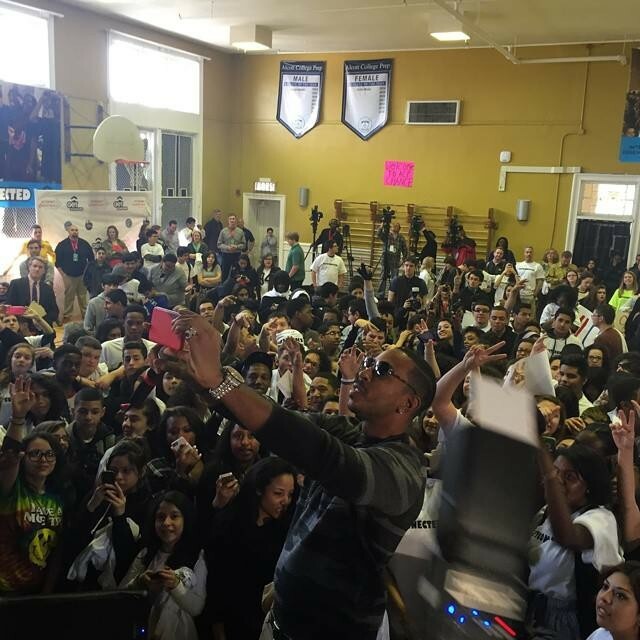 Saaayyyy Chheeesssee Ludacris taking a group selfie at #getconnected event held at Chicago’s Alcott Prep. But not before Luda took a group shot. No doubt Luda and Chance made these kids week.